How to Repair Damaged PSD on Mac Machine? Adobe Photoshop is an amazing application in the field of graphics and photography. This tool is often used to edit and design process on both Windows and Mac computers. The files created on Photoshop applications are of PSD and PDD formats. However, similar to any other files even Photoshop .psd files are highly vulnerable to problems such as corruption and damage. So, if you are a user with this kind of problem, then there is no need to get upset as it can be solved using Remo Repair PSD software. Remo PSD Repair Tool can efficiently repair PSD file Mac series of computers and laptops. 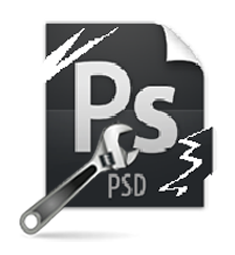 Bad sectors on storage media where PSD files are stored might corrupt your Photoshop PSD files. Whatever may be the reason behind PSD file corruption, the possible solution is Remo PSD Repair utility that can repair damaged PSD file Mac easily and qucikly with utmost accuracy. Remo Repair PSD is the expert recommended software for fixing damaged PSD file on Mac and it has also got good reviews by customers. Remo PSD Repair software offers you a simple and innovative way to repair Photoshop file on Windows as well as Mac OS running computers after severe damage. The software eliminates any problem associated with your Adobe Photoshop PSD file and turns your inaccessible, corrupt, broken PSD back to its working condition in few minutes. It fixes PSD file stored on any storage device including Mac hard disk, external hard disk, pen drives, flash cards, backup devices, etc. Remo Repair PSD utility supports PSD file repair after damage on all Mac OS X laptops such as MacBook Air, MacBook Pro, etc. including Mac Mini and iMac. Moreover, the tool is compatible to run on all latest versions of Mac operating system such as OSX Leopard, Snow Leopard, Mac OS X Lion, Mountain Lion, OSX Mavericks and Mac OS X Yosemite. Furthermore, the software is available for free demo download through which you can check its capacity by previewing repaired PSD document with all original contents before software purchase. In demo version, save feature will be disabled, you can only view the fixed PSD file but cannot save. But, when you get the activated version of tool, then you can save the repaired Photoshop PSD file on the desired storage location of your choice. It also includes external storage devices that are accessible to your Macintosh computers. You can fix damaged PSD file on Mac installed with different Adobe Photoshop versions such as Photoshop5.5, Photoshop 6.0, Photoshop 7, CS, CS1, CS2, CS3, CS4, CS5 & CS6. When you choose the software to repair damaged Photoshop PSD on Mac, then make sure that your Mac computer is having minimum of 50MB free disk space for installation and also 1GB RAM on it. Why Remo Repair PSD is a first choice of every Mac user? Simple graphical user interface that does not require technical knowledge for using the software for fixing damaged or corrupted PSD file. Completely automated repair process which completes damaged PSD file fix on Mac within a matter of minutes. Non-destructive software which doesn’t modify the original PSD file to mend damaged PSD files on Mac, instead creates healthy repaired PSD file with recovered layers and color modes. Free from all external threats of deadly viruses / malwares thereby ensuring secure PSD file repairing procedure. 24 / 7 technical assistance in case you need help while using software for fixing damaged PSD files on Mac systems. Step 1: Download and install Remo PSD Repair application. Launch the software by double clicking on the shortcut icon. Browse and choose the corrupt or damaged PSD file, which you want to repair and click on “Repair” button to start with the process to repair Photoshop file on Mac OS X. Step 2: The software scans the selected PSD file, starts repairing it and the repair process can be monitored by viewing the progress bar. Step 3: After repair completion, a new healthy PSD file along with its layers will be displayed. Step 4: Use “Preview” option to view the fixed PSD file and later on save the file to your desired location.